In aerogrill you can cook almost any mess. Very tasty porridge mixed with water and milk and add raisins, lemon peel or vanillin. 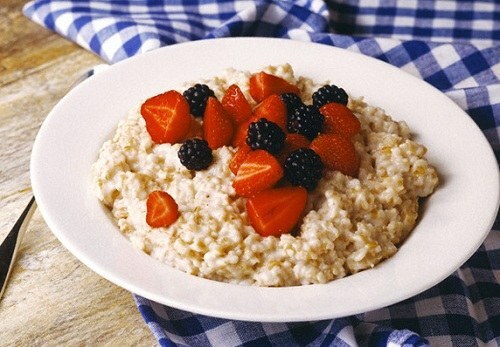 Salty porridge in aerogrill it is better to prepare in pure form or with addition of vegetables, mushrooms or meat. Millet cachacrou rinse several times in cold water to remove from it the bitterness. Then pour over boiling water and drain. Next, in a pot place millet, raisins and dried apricots. Mix all of this. Pour cold milk in at the bend of the pot and lubricate the inner surface of the bend oil. Add salt and sugar to taste. Put the pot on the lower grille aerogrill. Cook at medium fan speed at a temperature of 260 degrees for about half an hour until Golden brown. Then leave the pot in the convection oven for another 10 minutes. Kasaris rice, rinse and pour into the pot at the rate of 4 tablespoons per pot. Add the sugar, salt, raisins, dried apricots and butter. Pour cold milk in at the bend of the pot and lubricate the inner surface of the bend oil. Close the lid and put the pot on the lower grille aerogrill. Cook at medium fan speed at a temperature of 260 degrees for about half an hour until Golden brown. Then leave the pot in the convection oven for another 10 minutes. Oat cashew pot pour the cereal, add salt, sugar and pour milk on the curve of the pot. Bend grease. Close the lid and cook at a very high speed and temperature for 20 minutes. Remove the cover, put on the mess a crust of bread and cook at 180 degrees on medium speed for 10-15 minutes. Buckwheat cachacrou wash well and calcinate on a frying pan. Boil the mushrooms, finely chop and fry together with the finely chopped onions and garlic. In a pot add barley, mushrooms and cover with water. Salt. Cook on bottom rack of a convection oven on high fan speed at the temperature of 260 degrees for 30 minutes. The semolina Casamance rinse in cold water and leave it for 1-2 minutes. Then drain the excess water. In a pot on the bend pour the hot milk and add semolina, salt and sugar. Then, without covering with a lid, put in aerogrill. Cook on high at a temperature of 260 degrees for 10 minutes.